Evercrack, heroinware…these joking references to the addictive lure of online video games have become more real and ominous as the numbers of video game addicts rise, and as stories of neglect and despair mount. Massively multi player role playing games, or MMPRPG's, such as EverQuest, WarCraft or Diablo II, attract millions of players daily. Most players enjoy their pastime, many acknowledge spending countless hours in play, and some even admit to serious addictions compelling them to play. Many more have addictions that they deny. Gaming addicts report that video games have cost them marriages, lost them jobs and lost them custody of children. The real world repercussions of a virtual fantasy addiction can be extreme. A relatively new phenomenon, the incidence rates of gaming addiction are not known. Experts speculate that 5% of gamers are addicted, and admit that the numbers could be higher. Anecdotally, therapists say that more people are seeking help for their addictions (or more commonly - loved ones are seeking help for an addicted person) each year. When Does Game Play Become an Addiction? Answering yes to any of the following questions may indicate that you have a problem with video games. Do you find that you consistently play for far longer than you had intended to? Do you continue to play, even though your game-play causes you significant problems in your real life? Do you feel anxious or irritable when you are unable to play for any lengthy period of time? Do you ever lie about your game play, or the amount of time you spend playing? Do you ever lose track of time while playing? Why Are MMPRPG's So Addictive? Doctors studying video game addiction say that the reason that people get hooked – is that the games are designed purposefully to demand ever increasing amounts of game play. They are addictive by design. Players spend a great deal of time and energy into creating a character, their virtual persona, and the games are set up so that they must invest a great deal of time and effort to expand their character's powers and abilities. Players get focused on a goal of acquiring a new weapon or spell, and are very reluctant to stop playing before they have met their target. Of course, as soon as they do achieve their goal, there is always the next great thing, and the next. Addiction professionals liken this to a gambling addict chasing a win, and then continuing to play even after they do win. There is no end. Also, the games are by nature very interactive and players work together collaboratively to achieve certain tasks. Players feel that they cannot leave the game prior to fulfilling their obligations to their team. The social aspect of the games is a large part of the attraction for many players. In their virtual world they can be whoever they want to be, and it is relatively easy to improve their character. People who might find real world interactions difficult are particularly at risk for gaming addiction, drawn in by virtual friendships, often the only friendships they know. Developmentally, therapists say they see a lot of developmentally stunted people, people that have never learned how to socialize appropriately outside of a gaming environment. Finally, there is a real sense of escapism to entering a virtual world. 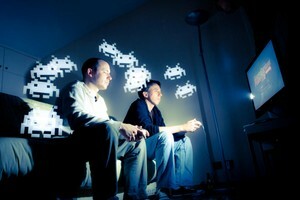 Gamers describe leaving their problems behind as they get immersed in their virtual kingdoms, and periods of gaming can be used as a break from the responsibilities of real life. This can become a negative spiral, as more time is spent playing, the problems of life intensify, and the response is through ever more gaming and escape. As technology accelerates, and virtual worlds become more expansive and truly interactive, the problem only worsens. Professionals speculate that the hundreds of thousands that now struggle with gaming addictions are just the tip of a coming and much larger iceberg. Addicted players are rarely able to quit playing on their own. Those that attempt to quit describe intense anxiety, cravings to play and irritability - A sense of feeling lost in the real world, and desperately wishing to re-enter their virtual and comfortable world. Some are able to quit on their own, many aren’t, and relapse rates back to gaming are high. Abstinence and therapy seem necessary to break the cycle of addiction. Few players are able to moderate their play after progressing to addiction. In some cases, pharmacological interventions can help. Cognitive therapy, in which users are taught to recognize negative thought patterns, and the behavioral repercussions of those thoughts, is seen as the most effective therapeutic intervention.